In recent weeks, as friends of mine have faced various trials, I’ve had occasion to marvel at the beauty of women asking for, giving, and receiving help. And I've not always been on the giving end; my servant-hearted husband frequently gives me food for thought and reasons to be thankful as I receive gracious help from him. We hate to feel needy; we don’t want to burden others. But when we are ashamed of our weakness, or too proud to admit our need, we commit robbery. 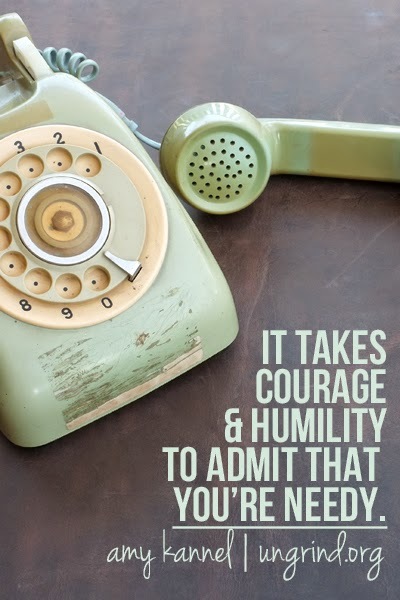 Click over to read my article at Ungrind today about the glimpses of glory that can be seen when we cast off our pride, admit our weakness, and ask for help. 7138. Jude looking out for a 2yo when he was messing with a plug/outlet, and then telling Daddy about it later: "He was about to get dead but I saved him!" 7155. we have obtained a faith of equal standing with the apostles! 7161. Jude telling Elijah in a heated argument: "Brothers are more important than Legos!" 7048. deep conversations, meals in restaurants, a free hotel room--luxurious day/night away! 7069. the way Elijah still says "Valentime"
7088. Christ in us, the hope of glory! 7095. "the stories are true / Jesus makes all things new!"